2. 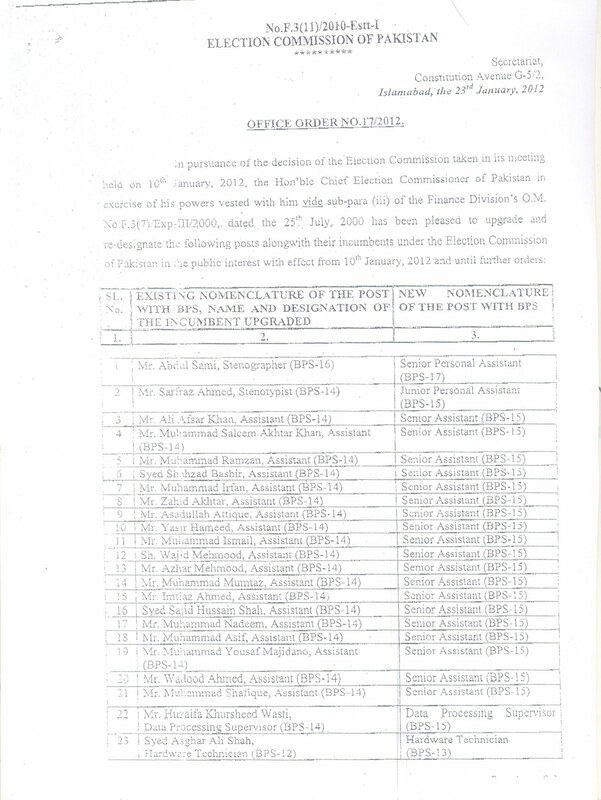 This Commission's Office Order No.60/2011, dated the 23rd April, 2011 is hereby cancelled and withdrawn ab-initio. 1. Accountant General, Pakistan, Revenues, Islamabad. 2. 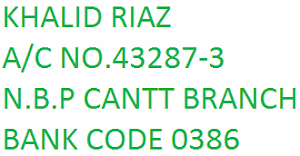 AD (Cash)/DDO ECP Secretariat, Islamabad. Hello colleagues.AOA, This is a good signe for others, it can be put up as example to other departments and can be challenge if some one does not do so.I request to all those who are in already in B-16 to put this example to their office for notification of B-17. I pray for provincial colleagues for upgradation of stenos. 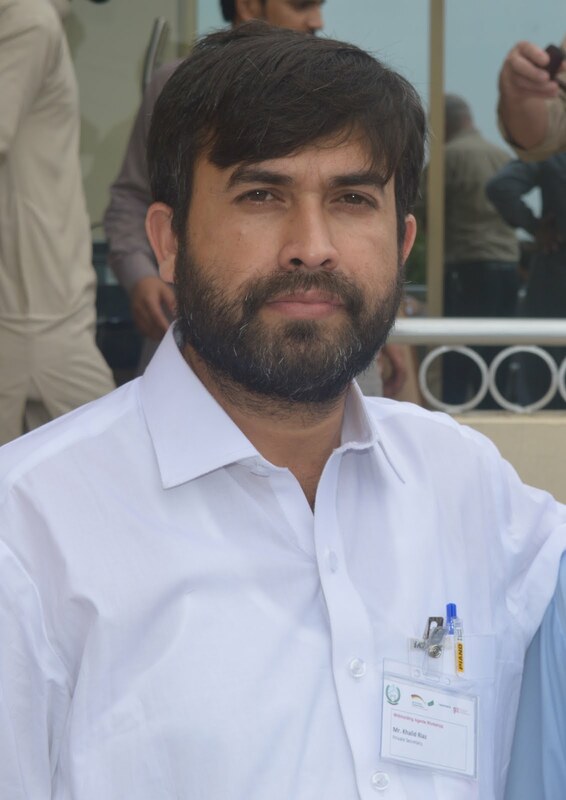 I am thankful to Khalid Bhai to put it on forum. I als cngratulate to all B-16 who have been promoted in B-17 and also to all who are waiting for upgradation. Please use this notification as example plus influance. The serial numbers of second page do not tally with first page. It seems that second page does not relate with first page, therefore it is ambiguous! 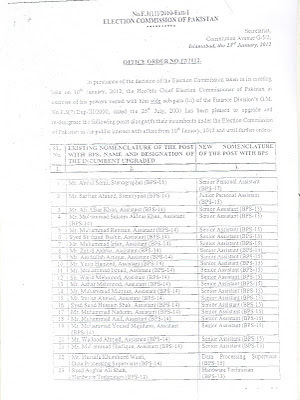 In fact, this is another order for up-gradation of ECP officials from B-1 to B-15. Bcoz in this order, Stenographers and Stenotypists have been upgraded from B-16 and 14 to B-17 and 15, therefore it is not in continuation of Finance Division's notification. Now the last page is placed. Mr. Khalid Riaz, Would you please upload all pages of that office orders, bcoz on contacting the ECP authorities have replied that they haven't issued any such order in this regard. This is the light of the candle lit by your goodself that Stenos are being benefited everywhere. Very good example and healthy sign for other Stenographers to contest for BS-17, their just right as in other cadres benefit of many scales have been given like LDC 5 to 7, Asstt. 11 to 14, Sr. Auditor 11 to 16 but we have been given just a lolly pop of 1 scale 15 to 17. BS-17 was our basic demand, which is our just and ultimate right. Hope you will do you utmost effort to have job done. We all are with you. In this regard appeal prepared by one of our Stenographer whos already in BPS-16 requesting that he may kindly be given BPS-17 time scale. And those whos recently been upgraded to BPS-16 they may be granted time scale BS-17 with a length of 3 years service. To whom we should sent this appeal for time scale of BS-17, who is the competent authority to sanction this. Is this not to be done by Federal Government or any Secretary or Head of department can grant this time scale to Stenographer already in 16 to 17, or newly upgraded Stenographers of BS-16. Sorry in my previous message I have written Stenographer scale from 15 to 17 (Being my heart's sound), the same was actually BS-15 to 16. Kindly excuse me and correction may be made.